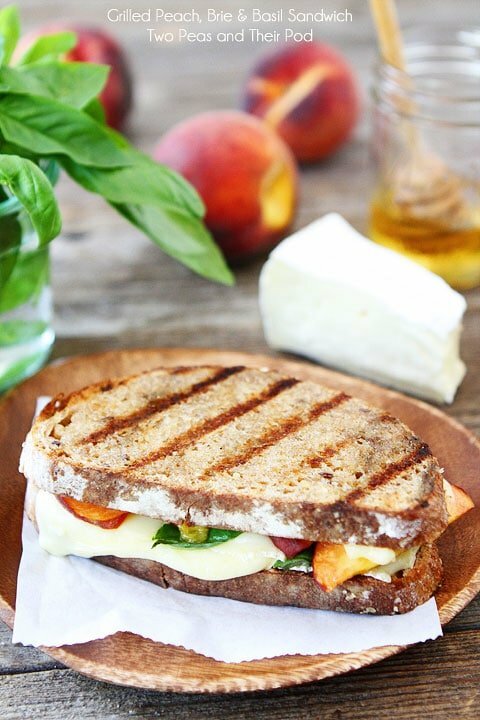 Grilled Peach, Brie & Basil Sandwich with a sweet drizzle of honey! A simple sandwich with gourmet flavors! The calendar may be telling us that summer is ending, but I am not paying attention. I am not ready to let summer go. I am having too much fun. If you are not ready to see summer go, ignore the calendar with us and make a Grilled Peach, Brie, and Basil Sandwich. 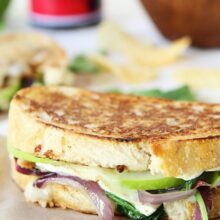 This simple grilled sandwich will help you savor the final moments of summer! It is a fabulous summer sandwich. 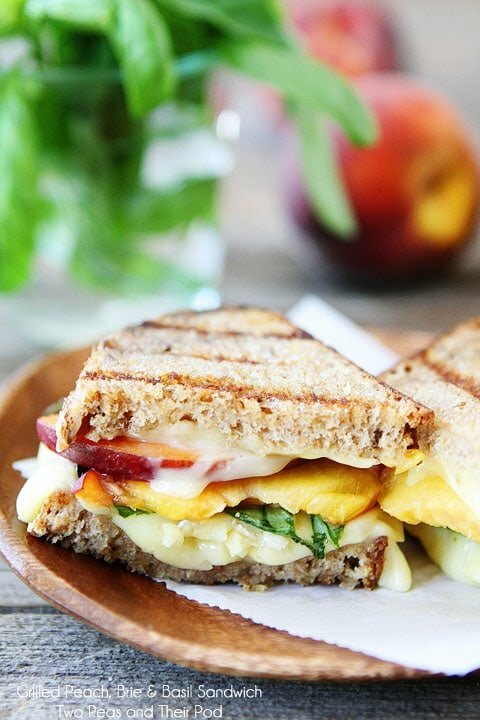 The sandwich ingredients are simple-bread, brie, peach slices, basil, and honey. I love all of these ingredients individually, but when they are combined in one sandwich…AHHH-MAZING! We used Harry and David Oregold Peaches to make to make our grilled sandwiches. 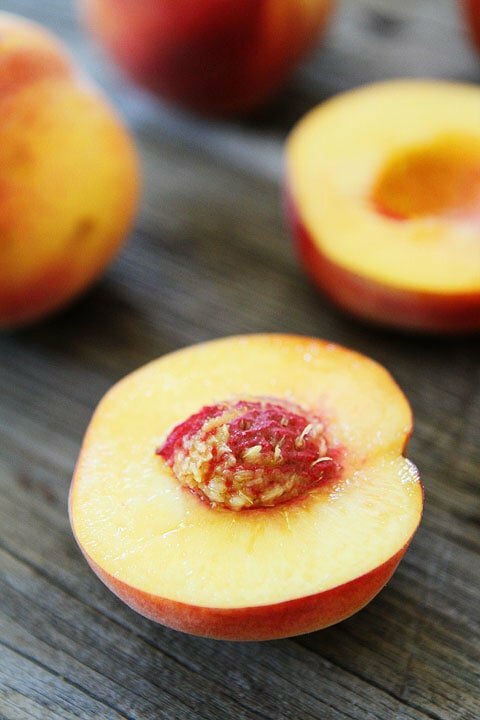 We love, love, love their peaches. They are perfect in every way. The peaches are soft, sweet, juicy, and smell heavenly. And the best part? You can have them delivered right to your door step. We usually devour the peaches right from the box, but I hid a few so we could make our sandwiches. We grilled our sandwiches outside because remember, we are not letting go of summer. The sandwiches only take a few minutes to make and when they are done, you will be in sandwich heaven. 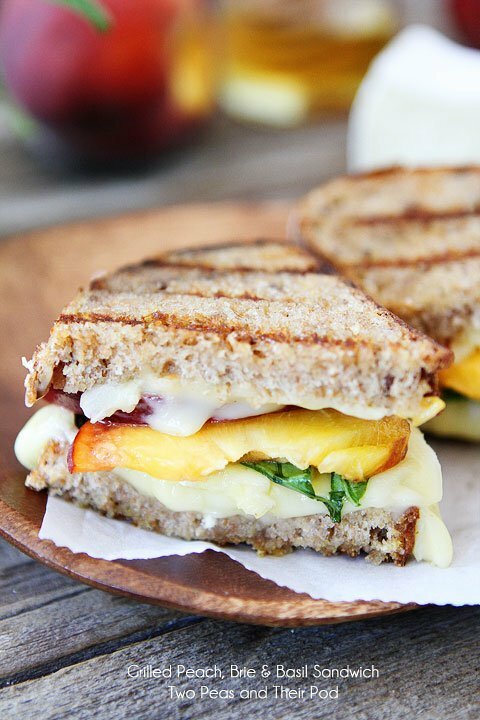 Buttery grilled bread with melty brie cheese, juicy peach slices, fresh basil, and a drizzle of sweet honey. Oh, baby! Savor the remaining days of summer and make a Grilled Peach, Brie, and Basil Sandwich. They will put you in a peachy perfect mood! Looking for a refreshing drink? Check out our Sparkling Rosemary Lemonade on Cafe Zupas. 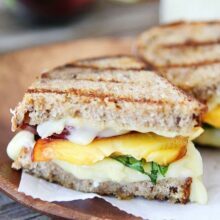 Grilled brie cheese sandwiches with peach slices, fresh basil, and a drizzle of honey. A simple summer sandwich with extraordinary flavors! 2. Butter the outside pieces of the bread slices. Assemble the sandwiches by layering brie, peach slices, and basil. Drizzle with honey. Top each with remaining 4 bread slices, butter side up. 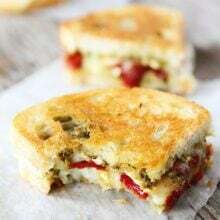 3.Place sandwiches on grill, grill for 2 minutes on each side or until lightly toasted and cheese melts. Remove from grill and cut sandwiches in half, if desired. Serve warm. Note-you can use a skillet pan or griddle pan to make the sandwiches. You can also use a drizzle of balsamic vinegar instead of the honey. Both are tasty! For gluten-free, use gluten-free bread. Disclosure-this post is sponsored by Harry and David, but our opinions are our own. We love Harry and David. You can read about our trip to visit Harry and David here. Sweet goes so well with cheese! A new all grilled cheese restaurant just opened up near us, I cannot wait to try it! Grilled cheese that has brie and fruit is the best! But it’s definitely made even BETTER with fresh summer peaches!! Oh this is right up my alley. I love brie, I love good peaches. And the photos are amazing. 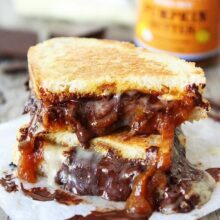 The calendar says we have till September 21 and you better believe I will be making this sandwich!! Like every other day until the 21st (of September)!! This thing is incredible and has ALL MY FAVORITE summer foods. Yes, please! Grilled sandwiches are one of my favorite things for lunch. I have to admit that I have never tried Harry & David peaches but they look perfect. So many of my favorite flavors in this sandwich! Obsessed! Well, thanks for planning my lunch today! I can just taste the melty brie already! YUM! Could really use this for lunch. Had something similar with mango but peach sounds perfect. I so want one of these for lunch today! This is like lunch and dessert combined!! love it!! What a gorgeous sandwich, yum!!! This looks amazing! I love the brie and basil. They go so well with peaches! Sounds fabulous! I’m not ready for summer to be over either! I have peaches I picked from my backyard tree that I need to use! Making this! A perfect combination, love grilled brie. A perfect lunch. A great way to add in yummy fruit to a already yummy sandwich! Love that you are hanging on to summer, I feel like I’m not ready for it to be over too! I need to get on this grilled peach thing! I love them served with ice cream or whipped cream, but have yet to try them in a savory application. I saw a grilled peach and goat cheese pizza recipe the other day. 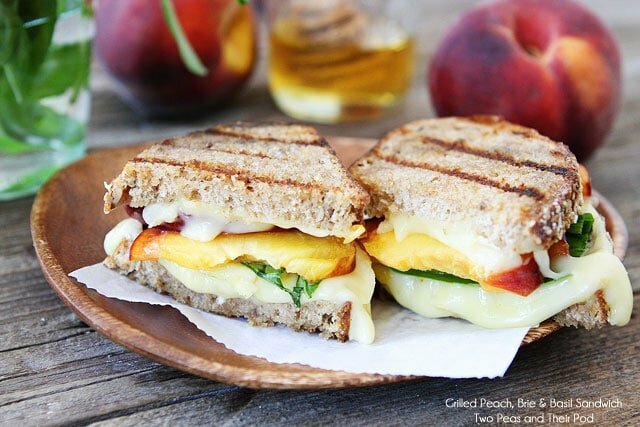 Obviously grilled peaches and cheese is something I need to try! I’m loving Brie on my sandwiches right not. I had brie with mango chutney the other day and it was amazing. What a beautiful sandwich, Maria! Perfect weekend food!! I’m so glad I stocked up on peaches at the market today. I am all over this! LOVE! I love everything about this sandwich. Looks like a beautiful sandwich! Could this sandwich be any more perfect?!! quite possibly one of the best combos ever! Love the addition of basil to already amazing peach+brie! What a great flavor combination! I love peaches, but never thought to put them in a sandwich. This combination looked so good when it arrived in my mailbox that I decided to make a peach, brie and basil pizza for dinner last night. Yum! I skipped the honey, because my local peaches (my daughter and I went picking at a friend’s house the other morning) were so sweet they didn’t need a thing. This sandwich looks unbelievably good!! This is definitely not a flavor combination I would have thought of myself, but it sounds so good! Summer always comes and goes so quickly so we need to make the most of it! This sandwich looks delicious. Instead of having a sandwich with a peach on the side, just add it right in! I love this recipe! I have a blog called Peas and Peaches, and I am looking for an inspiring recipe that includes both peas and peaches. If you do, I would love to make your recipe and post it on my blog, with linking your of course. If you have anything like that I would love to try it out. Congrats! This recipe has been nominated to win my Inspired Recipe of the Year Award. The shortlist will be announced on 12/30/2013. I love the look of this dish! Ok, you are the kings!